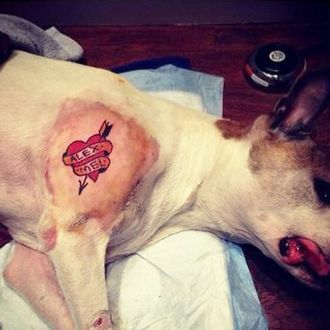 Good news for pet lovers everywhere: Governor Cuomo signed a law banning the piercing and tattooing of pets Monday, and it will go into effect exactly 120 days from now. The legislation is the result of a public outcry after some geniuses decided to pierce “gothic kitties” earlier this year, and after another brainiac gave his dog a heart-shaped tattoo. Doing either of those things can now land you up to 15 days in jail. If you really must express your special-snowflake-ness through your pet, though, there’s always the option of using non-toxic hair dye.